Enroll your child for Saturday morning fun at the Zoo. You can join, too! Zoo dieticians have to prepare meals for lots of animals every day. 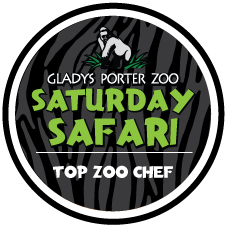 Come help feed some of the zoo’s animals after you learn what they eat. Classes are designed to give students an opportunity to learn more about exotic animals in the wild and in captivity and about staff dedicated to the conservation of these endangered species. Students will have plenty of hands-on activities to make each class memorable and educational. A Zoo tour, arts & crafts, animal encounter and snacks are included in each class. Cost is $15 per child or adult with a $5 discount for Zoo members. Class is from 1:00 a.m. to 3:00 p.m. in the South Texas Discovery Education Center. Pre-registration is required and space is limited. For more information or to register, please call 956-548-WILD (9453) or e-mail educ@gpz.org.